There have been warnings of famine in Yemen, Somalia and north-eastern Nigeria, but South Sudan is the first to declare one. 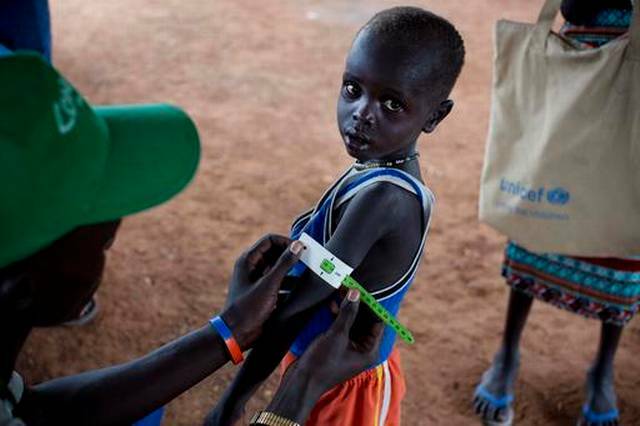 The famine is currently affecting parts of to Unity state in South Sudan, but humanitarian groups have warned that the crisis could spread if urgent help is not received. Aid agencies, including the UN World Food Programme (WFP) and the children’s fund Unicef, said that 4.9 million people – more than 40% of South Sudan’s population – are in urgent need of food. The report on Monday said that an increase in humanitarian assistance was needed in order to prevent the famine from spreading to other vulnerable areas. “If sustained and adequate assistance is delivered urgently, the hunger situation can be improved in the coming months and further suffering mitigated,” the report said. Head of the WFP in South Sudan, Joyce Luma, said that the famine was “man-made” after three years of conflict across the country stifled crop production and hit farmers and rural livelihoods. The impact of the conflict, combined with high food prices, economic disruption and low agricultural production has resulted in the area becoming “food insecure”, the report added. It is not the first time South Sudan has experienced such a crisis. During the war for independence from Sudan, the territory suffered from a famine in 1998. Last week, the WFP warned that more than 20 million people may face starvation in a series of famines over the next six months. The WFP’s chief economist, Arif Husain, said a combination of wars and drought meant that for the first time in recent years, aid workers were now talking about four simultaneous famines in separate parts of the world. He added that despite record levels of international humanitarian aid distribution, there was not enough to look after all the people in need.